We were halfway through our trip to the Pearl River Delta. Sitting on stools around a collection of small tables, we awaited our breakfast while a market bustled around us. This morning we were in Xiaozhou Village, an art village in the city of Guangzhou. 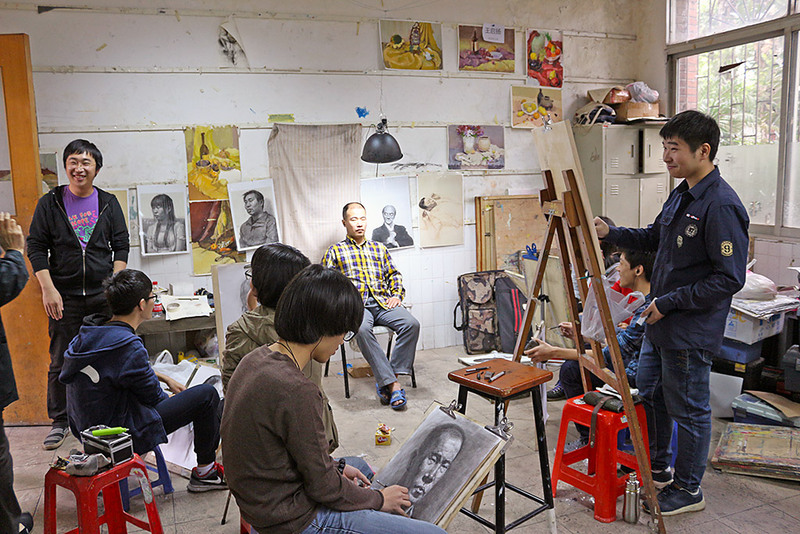 With interpreters from local universities we would visit numerous art training schools, artist residences, and museum spaces littered across Xiaozhou’s picturesque yet dusty canals. Each morning of this 14-day intensive fieldwork trip was a time to gather our thoughts on the previous day’s activities, its challenges and successes, and set new goals for the afternoon. As students that had never studied this region or traveled to China, this was a key part of the day where we could get a better understanding of our context, describe, compare and analyze its characteristics, while also negotiating our own roles as researchers. 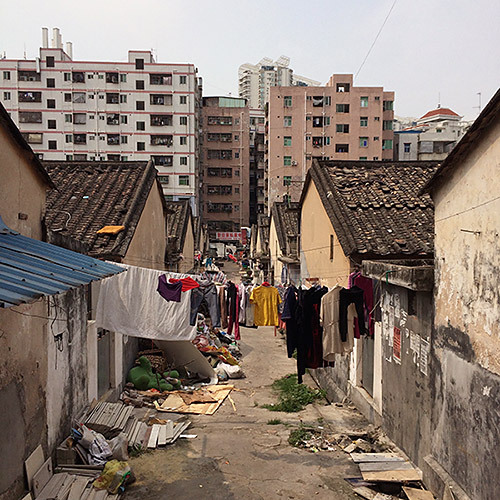 We were exploring this region as members of the Art + Village + City Research Studio, a cross-disciplinary endeavor designed to investigate a wide range of urban art villages in the Pearl River Delta. The Studio comprised of twelve students who came together from a variety of backgrounds and disciplines including anthropology, architecture, urban planning, landscape architecture, art history, and South and Southeast Asian studies. We spent two weeks traveling throughout the Pearl River Delta, researching a number of urban art villages including Dafen, Baishuzhou, and Xiaozhou, as well as the experimental art spaces Vitamin Creative Space and Handshake 302. Through various methods, we sought to examine of these villages’ historical development, current state, and future potential, mapping the diverse connections between art and urbanism distinct to this region. 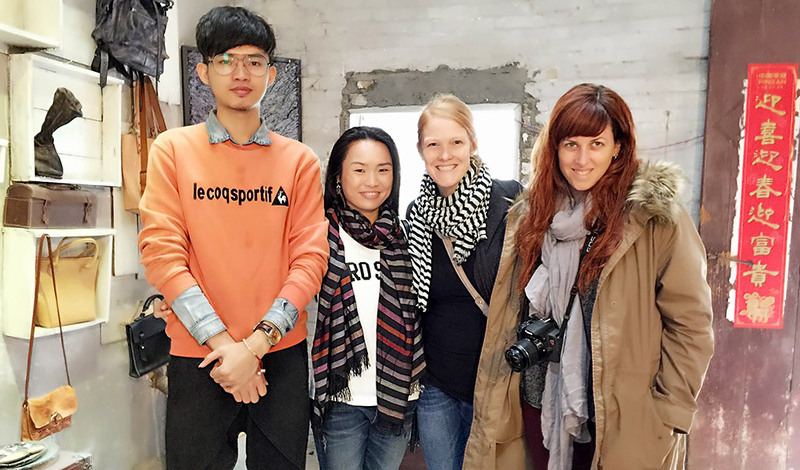 Professors Winnie Wong (Rhetoric) and Margaret Crawford (Architecture) co-taught the Art + Village + City Research Studio in Spring Semester 2015, and led the team that worked on the exhibition that following fall. 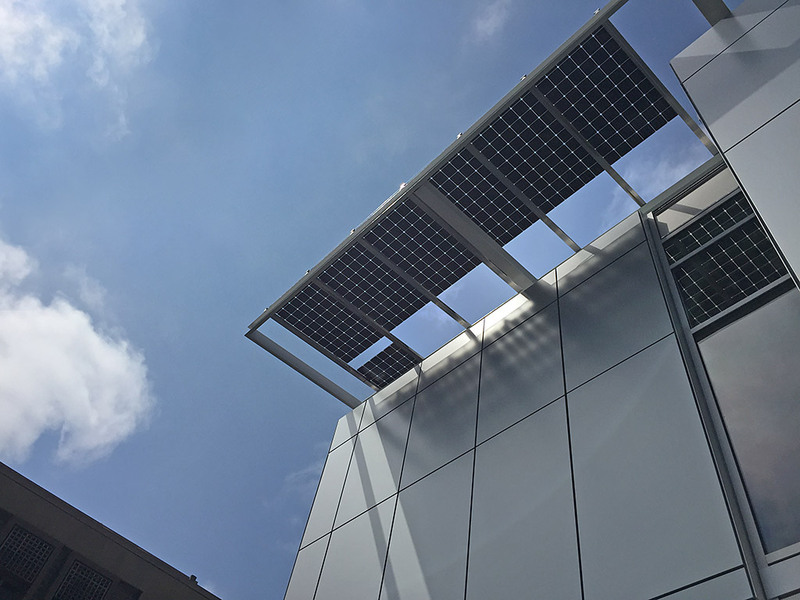 The studio is part of the Global Urban Humanities Initiative, a joint venture between the UC Berkeley Arts & Humanities Division of the College of Letters & Science and the College of Environmental Design. The Pearl River Delta of Southern China is a region of unusual urban transformation. 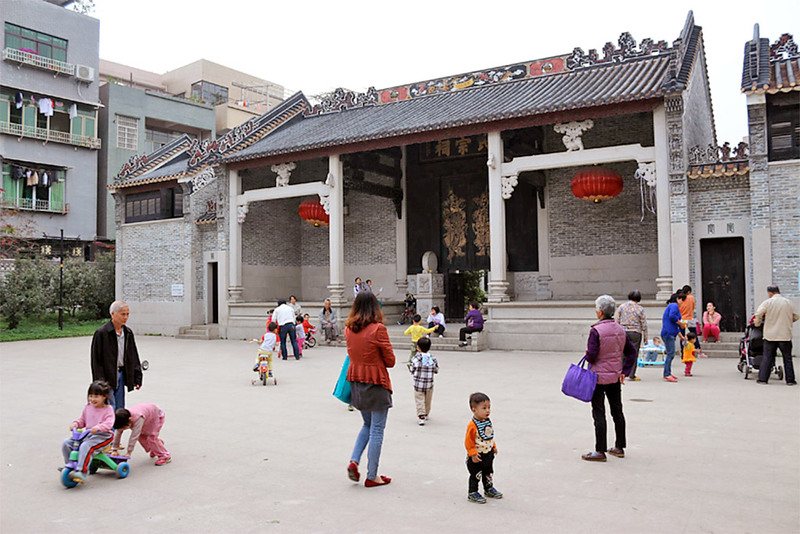 Its unique history of development — from agricultural villages to multi-city clusters — has resulted in independent villages surrounded by dense urban development, where Chinese citizens experience a rare autonomy. As central government policies have sought to diminish village power, citizens — from artists to officials, migrants to entrepreneurs — have come together to reimagine urban life. The “art village’ has emerged as a distinctive urban phenomenon in response to this dynamic between the village and the city. Although we landed in Hong Kong, our research began when we crossed the border to Shenzhen in Luohu. After visiting Dafen and Baishuzhou in Shenzhen we continued our journey to Guangzhou, and settled down in Xiaozhou Village. Each one of these urban villages presented particular tensions and synergies between art production, the built environment, and the state. During the trip we were required to write field notes every evening, take photographs and videos, perform interviews, and collect artifacts. This basic framework highlighted certain skills for each student, challenged others to learn new methods, while also providing a space to practice new ways of seeing and recording data, and to work collaboratively. Upon our return we compiled and shared what we had collected to produce our final projects. These projects focused on the curatorial rather than analytical process of research. The exhibition that opened in October 2015 in Wurster Gallery displayed the potential of this kind of interdisciplinary studio. It allowed us to come together once again, this time outside of the classroom, to rearticulate our experiences and the content gathered throughout the studio. 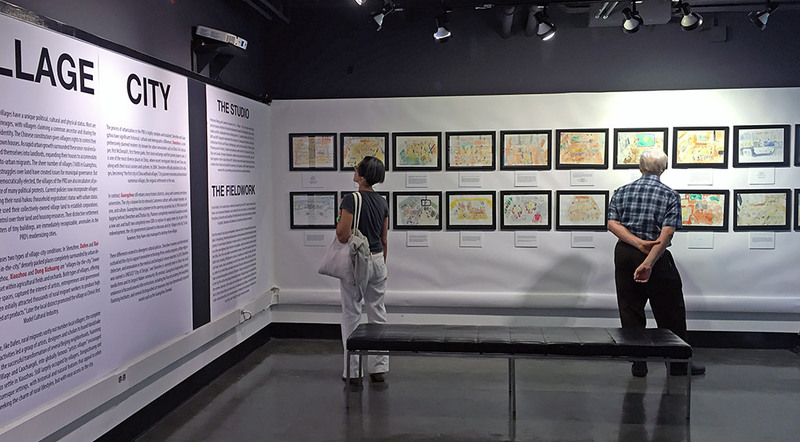 The exhibition itself posed new questions and problems: How could the exhibition communicate the complex narratives and relationships we saw without being reductive? How could we convey the physical experience of these sites? To answer these questions, we filled room 491 with our artifacts and images, transforming our classroom into a true workspace where the exhibit came to life. First, we codified the multiple media we collected during the trip, and after that we started to produce new representations of our experience in the Pearl River Delta through maps, collages, models, and dioramas. This was an experiment in academic generosity and collaboration, which set an example for us as young scholars. Soon we will go off to investigate our own research sites, or to work on our respective theses, and unlike the studio, these will be rather lonely processes. While we will miss the morning meetings we had every day in China, we will be able to use the methods, skills, and empathy that we learned through this collaborative environment in our own projects. In this way, we will each be inspired to recreate and reimagine collaborative approaches to research in order to open up new possibilities for future scholars and practitioners interested in learning about the messy, rich, and sometimes contradictory practices that form our cities. Trude Renwick (left) is a PhD student focusing on market spaces in Bangkok, Thailand where she has spent extended periods living and performing research. Her background is in anthropology and urban studies and received a Masters from the Graduate School of Design from Harvard University with a focus in the history and philosophy of design. 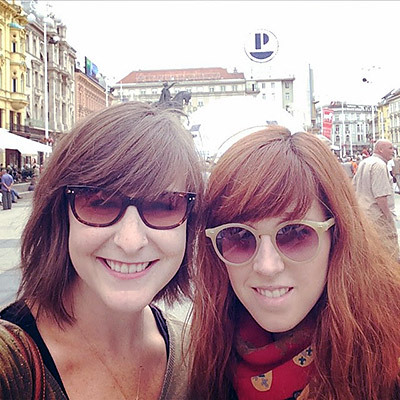 Valentina Rozas-Krause (right) is a PhD student in the Department of Architecture at the College of Environmental design. She is an architect with a Master’s Degree in Urban Development from the Pontificia Universidad Católica de Chile.